The Smart Vision EQ Fortwo wants to be a self-driving electric matchmaker. 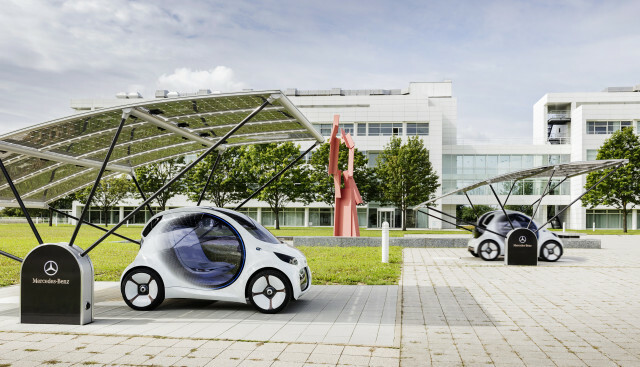 Ahead of its global unveiling at the 2017 Frankfurt Motor Show, Smart on Wednesday took the wraps off of an urban-oriented, self-driving electric concept car that can supply power back to the grid when it's not in use and could automatically visit an inductive charging station when it knows it's low on juice. 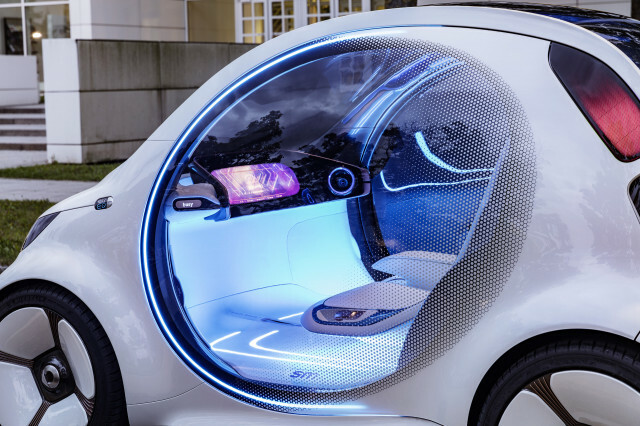 Perhaps most intriguingly, Smart says that the car is designed as an autonomous ride-share vehicle that could allow users to pick up an additional passenger based on their compatibility. 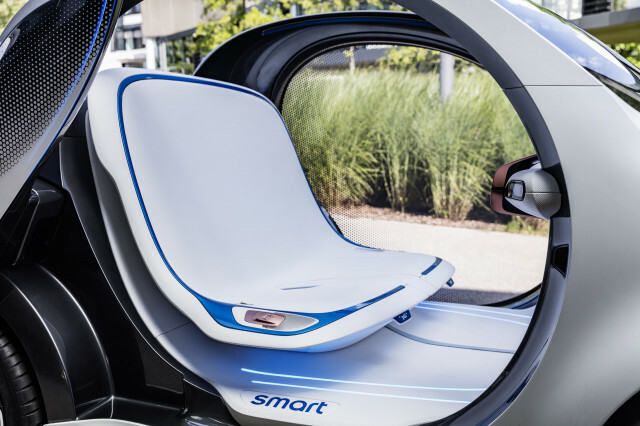 "When two passengers are on board, the large display in the interior shows shared interests such as concerts they have recently attended or sports that they play," Smart said in a release issued to members of the media. "The extra time gained as a result of traveling in an autonomous vehicle can be used to chat and interact." In other words, the Vision EQ Fortwo could be the next Tinder. Welcome to the future, folks. More practically, Smart envisions a future where passengers request a vehicle—perhaps through the automaker's Car2Go car-sharing service—that will pick them up. Or, maybe, the vehicle will pick up their children from school and deliver them to soccer practice. It's one of the most direct predictions of self-driving cars yet. A 30 kWh lithium-ion provides motivation, but Smart isn't talking about its specifications. 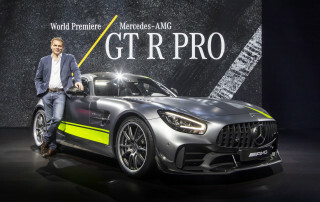 Neither is it focused on the car's styling, which hardly marks a departure from the brand's basic formula. What looks like a grille up front is actually a screen that can display different messages. Think of it like a far more communicative light-up taxi sign. The grille itself is lower on the Fortwo's fascia, which points the way forward for the Smart division's design languages. The concept marks a more radical departure inside. For one, there's no steering wheel and there are no pedals. 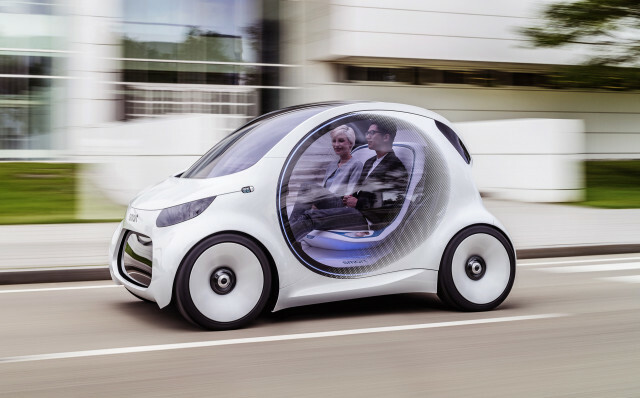 The Vision EQ Fortwo is a Level 5 autonomous vehicle that requires no input from its passengers once they've selected their destination using either the 24-inch touchscreen inside or a smartphone app. The white synthetic leather interior is designed for easy cleanup—something that's essential in a car-sharing vehicle. Safety is not a major consideration for the Vision EQ Fortwo since Smart says that impacts with other vehicles won't be a thing of the future. As a result, there are only a pair of lap belts to keep passengers in place over bumpy terrain. Airbags and shoulder belts will be a relic of the past, Smart suggests. 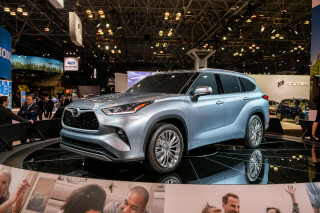 A bench seat provides room for two and the center armrest can be raised or lowered depending on just how close those passengers want to get to one another. That'll all depend on just how well the matchmaking goes, it seems.